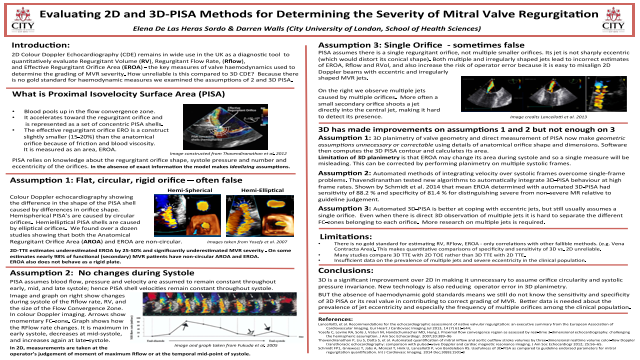 Abstract: Background: Proximal Isovelocity Surface Area (PISA) is a quantitative technique used in both 2D and 3D Colour Doppler Echocardiography (CDE) to assess the severity of mitral valve regurgitation. 2D-CDE is less costly and remains the most prevalent technique. The assumptions (idealizations) used in 2D-PISA methods, however, have been shown to be false or imprecise on the basis of 3D-CDE results. To date 3D methods themselves do not completely overcome these limitations. Aim: To systematically review findings that challenge the assumptions of 2D-PISA and evaluate how well 3D methods overcome these limitations. The three key assumptions in 2D-PISA that very often false are: 1) The regurgitant orifice is circular, flat and rigid; 2) Blood flow, pressure and velocity remain constant throughout early, mid, and late systole; 3) There is a single regurgitant orifice, not multiple smaller orifices and the regurgitant jet is not sharply eccentric. Conclusions: The assumption of circularity often leads to as much as 50% underestimation of the effective regurgitant orifice. Because 3D imaging enables direct visualization of valve and jet shape without geometric assumptions it largely overcomes one major limitation of 2D. Assumption two that systolic variation is small and irrelevant has also been shown to be false. Regurgitation varies so PISA should be calculated over the whole systole. This is being addressed by software that integrates 3D-PISA behaviour at high frame rates. The assumption of a single non-eccentric orifice is untrue often, but remains an active assumption of 3D-PISA. This is an important area for improvement.Summary: A systematic review which shows the findings that challenge the assumptions of 2D-PISA and evaluates how well 3D methods overcome these limitations. The three key assumptions in 2D-PISA that very often false are: 1) The regurgitant orifice is circular, flat and rigid; 2) Blood flow, pressure and velocity remain constant throughout early, mid, and late systole; 3) There is a single regurgitant orifice, not multiple smaller orifices and the regurgitant jet is not sharply eccentric. Lancellotti, et al. Recommendations for the echocardiographic assessment of native valvular regurgitation: an executive summary from the European Association of Cardiovascular Imaging. Eur Heart J Cardiovasc Imaging Jul 2013, 14 (7) 611-644. Yosefy C, Levine RA, Solis J, Vaturi M, Handschumacher MD, Hung J. Proximal flow convergence region as assessed by real-time 3-dimensional echocardiography: challenging the hemispheric assumption. J Am Soc Echocardiogr. 2007;20:389–96. Thavendiranathan P, Liu S, Datta S, et al. Automated quantification of mitral inflow and aortic outflow stroke volumes by three-dimensional realtime volume color-flow Doppler transthoracic echocardiography: comparison with pulsed-wave Doppler and cardiac magnetic resonance imaging. J Am Soc Echocardiogr 2012; 25:56–65.